One fan's quest to ride and review every attraction at the Disney Theme Parks. 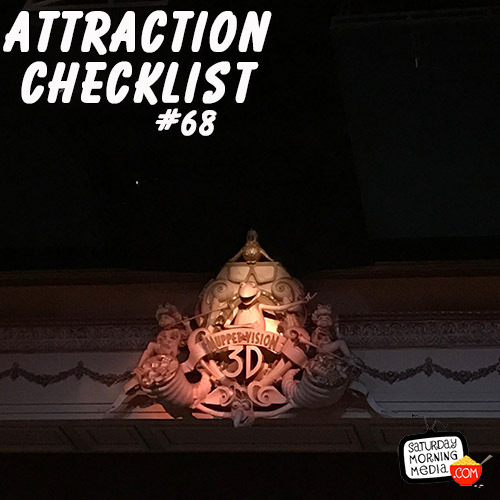 http://www.attractionchecklist.com – This episode, John and I head over to Disney’s Hollywood Studios to watch the classic Muppet*Vision 3D. What rating will it receive? Tune in and see! Recorded on March 20, 2019. In this episodes we Meet The Muppets as we head to Disney’s Hollywood Studios to watch Muppet*Vision 3D. The park’s guide map says: Experience the magic of The Muppets in this 3D extravaganza. There are no age or height requirements for this attraction and, funnily enough, no Thrill Level is listed. That said, FastPass+ is available. 1. Muppet*Vision 3D opened at Disney’s Hollywood Studios on May 16, 1991. This was well before Disney purchase the rights for the Muppets making the attraction a unique collaboration between Jim Henson Productions and Walt Disney Imagineering. Disney purchased the Muppets in 2004. 3. The script for Muppet*Vision 3D was written by Bill Prady who also wrote the script for the Honey, I Shrunk The Audience attraction. Bill Prady would later go on to co-write the 2015 revival of The Muppets on ABC but his most successful venture has been co-creating the hit tv series The Big Bang Theory. 4. When the show first opened, puppeteers from The Jim Henson Company were on hand to train the suit performers who would be operating Sweetums in the exact methods of how the character should walk and move. In recent years, Sweetums will pop out into the lobby briefly to wave to the fans waiting to enter the theater. This doesn’t happen all the time but it is pretty unique when it does. 5. In 2014, around the release of the film Muppets Most Wanted, the villain Constantine was added to the pre-show as if he was interrupting the broadcast. This interruption remained in the pre-show until December of 2016. Let’s not waste any time, let’s start the show. Joining me once again is John B. deHaas and after the show we’ll give you our thoughts on this attraction. This is a binaural recording so if you have headphones put them on now as we experience MuppetVision 3D at Disney’s Hollywood Studios.